J and M Racing and Farm's Jm Mr Evan posted the fourth fastest time to the Mr Jess Perry Stakes on Sunday at Ruidoso Downs. 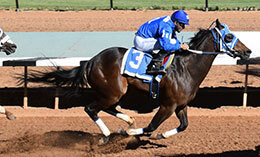 RUIDOSO DOWNS, NM�MAY 29, 2016�Two sons of multiple stakes sire IVORY JAMES qualified to the $100,000 Mr Jess Perry Stakes at Ruidoso Downs on Sunday. The 400-yard race, for the second 10 fastest qualifiers from the $1.04 million Ruidoso Derby(G1) trials, will be contested on Saturday, June 11th. J and M Racing and Farm's lightly raced Jm Mr Evan posted the fourth fastest time to the Mr Jess Perry Stakes final after finishing second to last year's All American Futurity(G1) winner Jess Good Candy in Trail #10. The multiple stakes-finalist, by IVORY JAMES from the Tour de Kas mare Lawanda Fay, completed the 400 yards in :19.964 seconds into a headwind. Albert Franco conditions with Sergio Becerra, Jr. riding. Bred in Arkansas by Joyce and Troy McClennen, Jm Mr Evan was also a finalist in the Grade 3 West Texas Derby and the Rainbow Juvenile Invitational. The winner of three of six starts has earned $14,698. IVORY JAMES second finalist is West Texas Futurity(G2) finalist Dig This James. Ridden by jockey Adrain Ramos, the Oklahoma-bred gelding posted a :20.021 time to get the final starting spot in the Mr Jess Perry Stakes. Juan Ganzalez trains the gelding. out Digging On High by Digging For Gold, for owners Joe and Jason Rios. Vicki Banks is the breeder. The $100,000 Mr Jess Perry Stakes will be held Saturday, June 11th for horses who did not qualify in todays Ruidoso Derby trials. For a list of preferred invites with the second 10 fastest times from today's trials CLICK HERE.